The new Batch Data Analysis Macros interface is shown here. 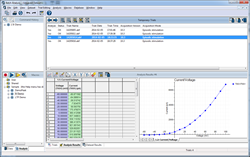 The Batch Data Analysis Macros is one of the many new features introduced in the pCLAMP 11 Software Suite. Molecular Devices, LLC, a leader in protein and cell biology technologies, announced the launch of the newest generation of its widely-used data acquisition and analysis software for patch-clamp electrophysiology, pCLAMP™ Software Suite Version 11 today. Among many new features, this latest version of the software includes intelligent data analysis capabilities as a part of the new Clampfit Advanced Analysis Module, allowing for improved automated event detection and batch analysis of data. Electrophysiology tools including Molecular Device’s Axon suite of instruments and pCLAMP Software enable researchers to conduct basic neuroscience research as well as investigating ion channel interactions related to neurological or cardiac disease states. Fueled by federal and private funding, continued growth in neuroscience research is expected as scientists seek treatments for disorders such as Alzheimer’s and Parkinson’s diseases. pCLAMP 11 software is well positioned to help scientists gain deeper insights into cell membrane potential measurements.